This attractive 15-story apartment house was built by Anthony Campagna as a cooperative and completed in 1926, one year after its virtual twin across 93rd Street, 1120 Fifth Avenue, was completed. 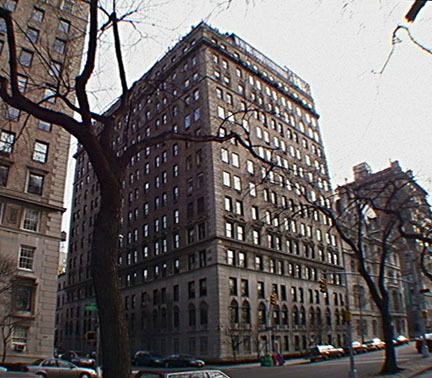 Both buildings were designed by J. E. R. Carpenter, the leading designer of luxury apartment buildings in New York City in his generation. This building was 41 apartments and 1120 Fifth Avenue has 44 apartments. The main difference between the two is that this one has arched mouldings above its second and 11th floor windows while the other one has regular windows, and this one has a sidestreet entrance while 1120, whose facades are a bit more elegant, has a Fifth Avenue entrance. The building has attractive sidewalk landscaping and its Carnegie Hill neighborhood is very convenient to many private schools and museums. This part of Upper Fifth Avenue is very pleasant and quiet, perhaps because most parades stop at 86th Street on the avenue. Many attractive restaurants and boutiques are nearby on Madison Avenue. The building has a doorman, a large lobby and sidewalk landscaping, but no balconies and no garage. A very large and tall glass enclosure, shown above, was added to the roofline along Fifth Avenue after World War II.